Now for the final installment of our seven part series on the 2013 Jane Addams Children’s Book Award Ceremony. 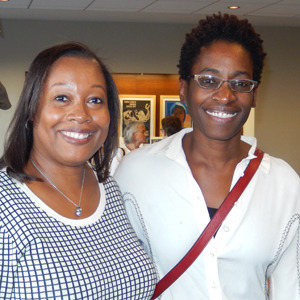 Below you will find the introduction given by Sonja Cherry-Paul for Each Kindness by Jacqueline Woodson. Jacqueline Woodson uses clear understated language to capture the subtle ways in which cruelty and bullying appear in classrooms, schools, and in the lives of children. Each Kindness is a beautiful and poignant story that shines a light on what happens when children reject, rather than embrace, difference. Maya is new to the school and when she is brought to her new classroom, Chloe and her friends stare at her. They shun her in class and at recess. They nickname her “Never New” and mock her clothes and shoes that appear old and worn. Whenever Maya attempts to play with them, they say no. And so, at recess Maya stands by the fence or jumps rope alone. Soon Chloe and her peers notice that Maya’s seat in the classroom is empty and after several days, they discover that Maya would not be returning to class. Chloe’s shame is palpable to readers. “That afternoon, I walked home alone. When I reached the pond, my throat filled with all the things I wished I would have said to Maya. Each kindness I had never shown.” Embedded in this emotional story are the missed opportunities to form friendships and the lasting effects of regret when indifference is chosen over kindness. The serene elegance and beauty of the text and paintings in Each Kindness is juxtaposed with an intense message: Our actions matter and kindness makes a difference in the world. This message resonates long after Ms. Albert says, “This is what kindness does. Each little thing we do goes out, like a ripple, into the world;” long after Chloe watches “the water ripple as the sun set through the maples and the chance of a kindness with Maya became more and more forever gone;” long after readers turn the final page of this book. 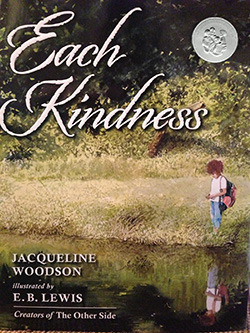 It is my great pleasure to present the winner of the Jane Addams Children’s Book Award in the category of Books for Younger Children to Jacqueline Woodson for Each Kindness, illustrated by E.B. Lewis and published by Nancy Paulsen Books a division of Penguin Books Young Readers Group.